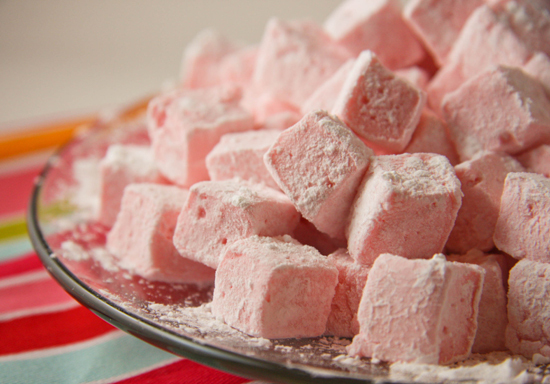 In addition to being simply adorable, these homemade marshmallows are so tasty. These fluffy treats can be colored, or cut into fun shapes. Eat them plain or put in your hot cocoa, either way you won't be disappointed! These are worth the wait! 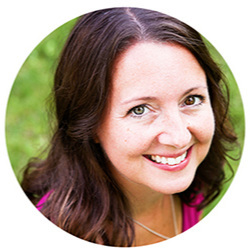 In one of Ebby's recent posts, she talked about cute food being so much fun. I wholeheartedly agree! When I finished making this treat, I said, "Aawwww, how CUTE!" Then I may or may not have hugged the squishy ziploc bag filled with teeny, pink marshmallows. In addition to being cute, they were also deliciously tasty. I loved them as a snack, but I LOVED them in hot chocolate. YUM YUM YUM. They don't take a ton of effort (at least not as much as I anticipated), but they do require some significant sitting time. It's worth it, trust me. I had to force myself to stop taking pictures! Cute cute cute! In a small saucepan, soften 4 tablespoons of unflavored gelatin in 3/4 cup of water. If you run out of unflavored gelatin like I did, substitute 1 tablespoon with flavored gelatin. In my case, strawberry. This ended up being a happy accident because it provided a hint of added flavor and color that I loved in the end. Heat the gelatin slowly so it fully dissolves in the water. Do not allow the mixture to boil. Stir in 1/2 teaspoon of vanilla and set aside. Can you see an upside-down Pip taking a picture? And now (below), can you see a four-eyed smiley face? Set the saucepan over medium heat and stir until the sugar dissolves. Increase the heat and bring the mixture to a boil. Set a candy thermometer in the pan and, without stirring (I was so happy about this non-stirring part), allow the mixture to boil until it reaches 250-260 degrees F. This went a lot more quickly than I anticipated. I was a bit overwhelmed at this point because I was trying to do seventeen things at once, but it took somewhere around 15 minutes to reach the desired temperature. While the sugar mixture is boiling, beat 2 egg whites in a large mixing bowl on high speed with an electric hand mixer until medium-stiff peaks form. When the sugar syrup reaches 250-260 degrees, slowly add it to the whisked egg whites and beat with mixer until combined. Immediately add the dissolved gelatin to the mixing bowl and beat on high speed. It will turn to a liquid at first, but will eventually thicken. Continue beating until the marshmallow mixture thickens enough to hold its shape, about 5-8 minutes. 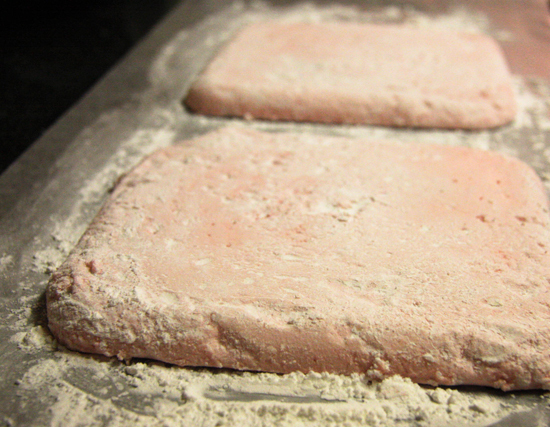 Lightly grease two 8x8 inch baking dishes and dust them with part of the cornstarch-confectioners' mixture. Divide the marshmallow mixture between the two pans and smooth as flat as possible with a rubber spatula (do this quickly!). Allow the pans to sit uncovered until springy and firm, 4-6 hours. I let mine sit for a full 6 hours. Using a sharp knife, loosen the marshmallows from the sides of the pans. Dust a long sheet of waxed paper with more of the cornstarch-confectioners' mixture and flip the marshmallows onto the paper. Dust all visible surfaces of the marshmallows with more of the cornstarch-confectioners' mixture. Allow them to sit for another 2 hours. 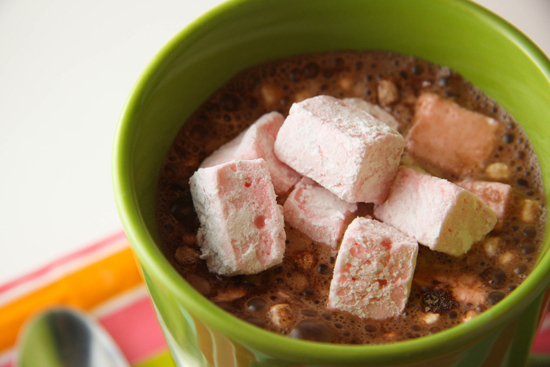 With a sharp knife, cut the marshmallows into even strips 1-1 1/2 inches wide. Dip your knife into cold water after each cut to clean the blade and to make cutting a whole lot easier. Cut the marshmallows into squares and coat all sides with confectioners' sugar. These cute little treats are worth the wait! 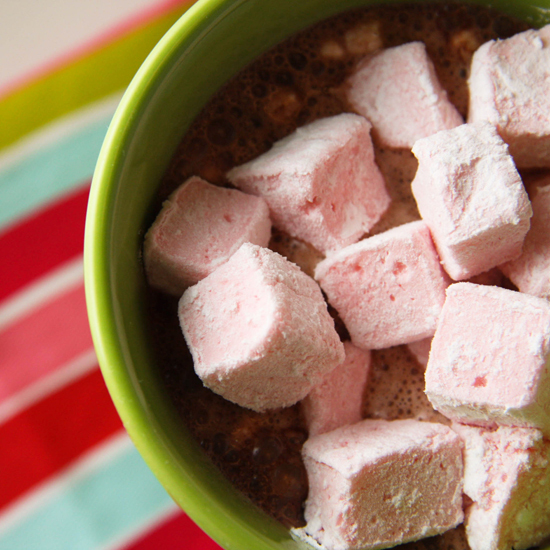 In addition to being simply adorable, these homemade marshmallows are so tasty. Eat them plain or put in your hot cocoa, either way you won't be disappointed! These are worth the wait! 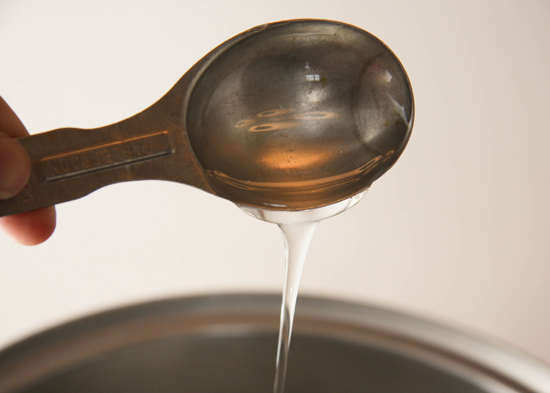 Soften the gelatin in ¾ cup water in a small saucepan. Heat the gelatin slowly to fully dissolve it, but don’t let it fully boil. Stir in vanilla. In a saucepan, combine sugar, corn syrup and ¾ cup water. Set over medium heat and stir until sugar dissolves. Increase heat and bring mixture to a boil. Set a candy thermometer in the pan and, without stirring, let the mixture to boil until it reaches 250-260 degrees F. While the sugar mixture is boiling, beat the egg whites in a large bowl on high speed with an electric hand mixer until they form medium-stiff peaks. 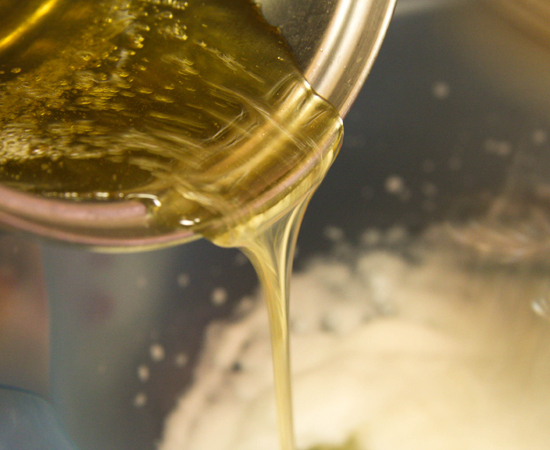 When the sugar syrup reaches temperature, slowly add it to the whisked egg whites and beat with mixer until combined. 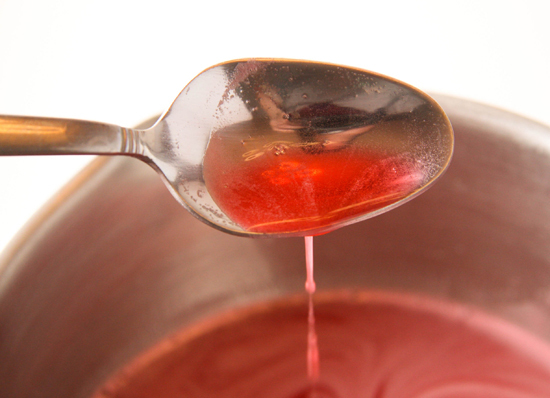 Immediately add the dissolved gelatin to the bowl and beat on high speed. It will turn liquid at first but will eventually thicken. Continue beating until the marshmallow mixture thickens enough to hold its shape, about 5-8 minutes. Lightly oil two 8x8 inch baking dishes and dust them with part of the cornstarch-confectioners’ sugar mixture. Divide the marshmallow mixture between pans, smooth as flat as possible with a rubber spatula and let them sit uncovered until springy and firm, 4-6 hours. Using your fingers or a sharp knife, loosen the marshmallows from the sides of the pans. Dust a long sheet of waxed paper with more of the cornstarch mixture. Flip the marshmallows onto the paper. Dust the surface with more of the cornstarch mixture and let marshmallows sit for about 2 more hours. 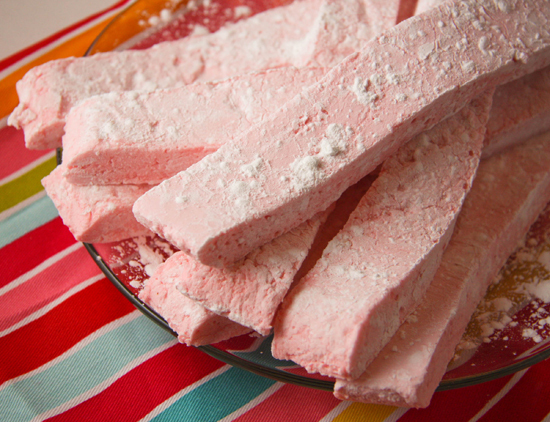 With a sharp knife or scissors, cut marshmallows into even strips about 1-1 ½ inches wide and then cut into squares. Dip knife in cold water after each cut to clean the blade and then coat the edges of the marshmallows with confectioners’ sugar.